A complex mixture of homophobia and racism in the Greenaway Estate, somewhere in Northern Ireland, provides the story for this fourth book from McGilloway, featuring DS Lucy Black. The book starts with a sermon from Pastor Nixon railing against homosexuality, and suggesting that homosexuals should be stoned, and is swiftly followed by the discovery of a body of a man, with his head bashed in by a rock, who turns out to have been homosexual. Alongside this, DS Black and her partner Tom Fleming, are called to the house of the Lupei family, Romanian immigrants, who have had the sign ‘Romans out’ painted on the side of the house. While they are there, Mrs Lupei gives them a leaflet that is being handed out on the Greenway Estate, which refers to Brexit, the chance to get rid of immigrants, and the statement ‘local housing for local people’. Clearly this is a family under threat, and Lucy is worried about potential escalation. Sprinkled into the mix are ‘legal highs’, drugs being sold by someone, with the claim that someone in the Lupei family is involved in selling drugs, strongly denied by Mr and Mrs Lupei. And of course, in the background is the ever-present history of Northern Ireland and the ‘troubles’. It’s an interesting complex story, characterised by the reluctance of almost everyone involved refusing to talk, or give any information out that might help the police, which makes life difficult for Lucy and Tom, and this reluctance leads to further violence. There are the usual few blind alleys and then an eventual resolution that brings all the threads together, without too many surprises. The backstory, is that Lucy’s mother is a senior police office, who left her with her father when she was just 8 years old, but as Lucy’s mother uses her maiden name, very few people actually know that the two are related, and Lucy wants to keep it that way. She blames her mother for the family breakup, and remains fiercely loyal to her father, who is now in a care home, suffering from dementia. Lucy is living in her father’s house, and has a lodger called Grace, a street girl that she offered a home to, at the end of the previous book, and is finally coming to terms with her father’s disease. Gradually throughout this story, there is also a softening in relations between Lucy and her mother, which is interesting to watch. However, apart from this, there is almost no other personal backstory of any kind, in contrast to earlier books in the series, and I found this a little disappointing. The main focus of the book is then directly on Lucy and Tom and their efforts to uncover who is behind the killing of the (initially) unidentified man, and those behind the targeted attacks on the Lupei family. Without giving too much away, there is somewhat of a mixed message about ‘Brexit’, immigrants, and possible links to drugs, which I found somewhat uncomfortable. However, Lucy is strong in her support of the Lupei family, making efforts to help them get rehoused away from the Greenway Estate, where they will be safe. There are sympathetic noises towards the homosexual issue, where it seems particularly difficult for members of the ‘macho’ male community, to openly admit that they are gay, and Lucy determinedly challenges Pastor Nixon on his homophobia. Lucy is a strong, likeable, detective and Tom works well as a sensible, level headed foil to her more headstrong approach. Overall, the book has strong lead characters, a complex story with some surprises, and an interesting mix of prejudices that drive the plot. The shortlist for crime writing’s most wanted accolade, the Theakston Old Peculier Crime Novel of the Year, has been announced. The most prestigious prize in the crime genre is now entering its 13th year. The shortlisted six were whittled down from a longlist of 18 titles published by British and Irish authors whose novels were published in paperback between 1 May 2016 and 30 April 2017. The 2017 Award is run in partnership with title sponsor T&R Theakston Ltd, WHSmith, and The Mail on Sunday. Essex-based writer Eva Dolan returns to the shortlist for the second year; Tell No Tales was shortlisted in 2016. Her follow-up After You Die is the third book from the author BBC Radio 4 marked as a ‘rising star of crime fiction’. Shortlisted for the CWA Dagger for unpublished authors when she was just a teenager, her debut novel Long Way Home, was the start of a major new crime series starring two detectives from the Peterborough Hate Crimes Unit. Susie Steiner is also a former Guardian journalist. Her first crime novel introduces Detective Manon Bradshaw, working on the high profile missing person’s case of Cambridge post-grad Edith Hind, daughter of Sir Ian and Lady Hind. Can DS Manon Bradshaw wade through the evidence before a missing person inquiry becomes a murder investigation? Missing, Presumed, was a Sunday Times bestseller, a Richard & Judy pick and was praised for its stylish, witty and compelling writing. Chris Brookmyre beat stiff competition to win the Scottish crime book of the year award with his novel, Black Widow, a story of cyber-abuse, where ‘even the twists have twists’. It features his long-time character, reporter Jack Parlabane. Scotland’s first minister, Nicola Sturgeon tweeted that she had been given the novel as an early Valentine’s Day present by her husband, declaring it ‘brilliant’. Val McDermid, acknowledged as the ‘Queen of Crime’ has sold over 15m books to date. Her latest number one bestseller, Out of Bounds, features DCI Karen Pirie unlocking the mystery of a 20 year-old murder inquiry. The book is her 30th novel. The shortlist was selected by an academy of crime writing authors, agents, editors, reviewers and members of the Theakston Old Peculier Crime Writing Festival Programming Committee. The titles will now be promoted in a seven-week promotion in over 1,500 libraries and WHSmith stores nationwide throughout June and July. The overall winner will be decided by the panel of Judges, alongside a public vote. The public vote opens on 1 July and closes 14 July at www.theakstons.co.uk. The winner will be announced at an award ceremony hosted by broadcaster Mark Lawson on 20 July on the opening night of the 15th Theakston Old Peculier Crime Writing Festival in Harrogate. They’ll receive a £3,000 cash prize, as well as a handmade, engraved beer barrel provided by Theakston Old Peculier. It’s also been announced that the awards night will honour Lee Child. The Jack Reacher creator will receive the Outstanding Contribution to Crime Fiction Award, joining past winners Val McDermid, Sara Paretsky, Lynda La Plante, Ruth Rendell, PD James, Colin Dexter and Reginald Hill. Winner of the Petrona Award 2017 was Gunnar Staalesen for Where Roses Never Die translated by Don Bartlett. (Watch the whole presentation ceremony here). So many shortlists, longlists and winners were announced over the weekend, I'm going to break it up into several posts. 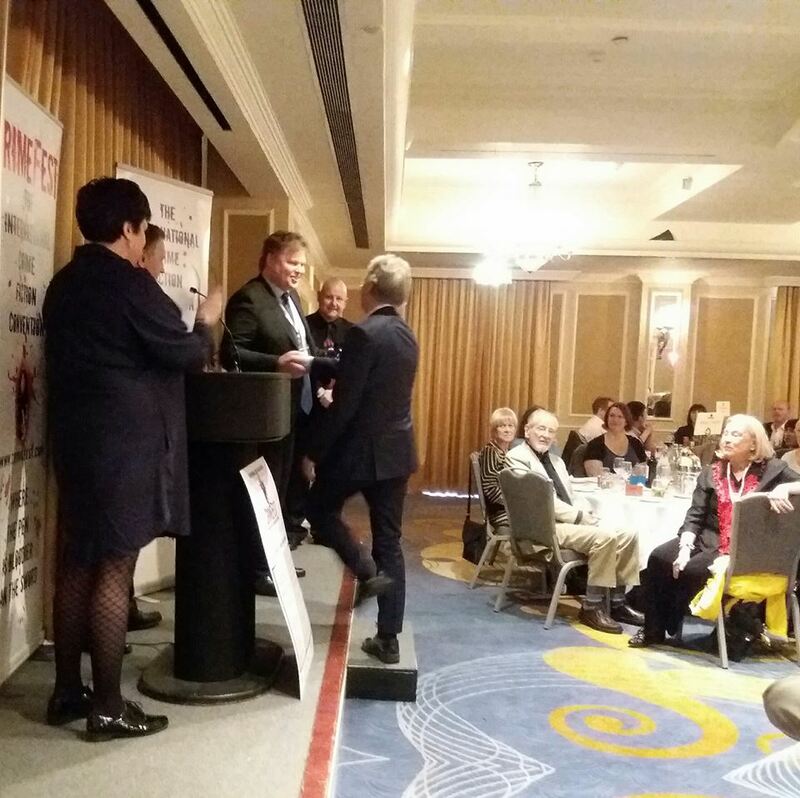 Shortlists for the Daggers will be announced later in the summer and the winners will be announced at the Dagger Awards dinner in London on 26 October, for which tickets will be available shortly. Visit www.thecwa.co.uk for more information. 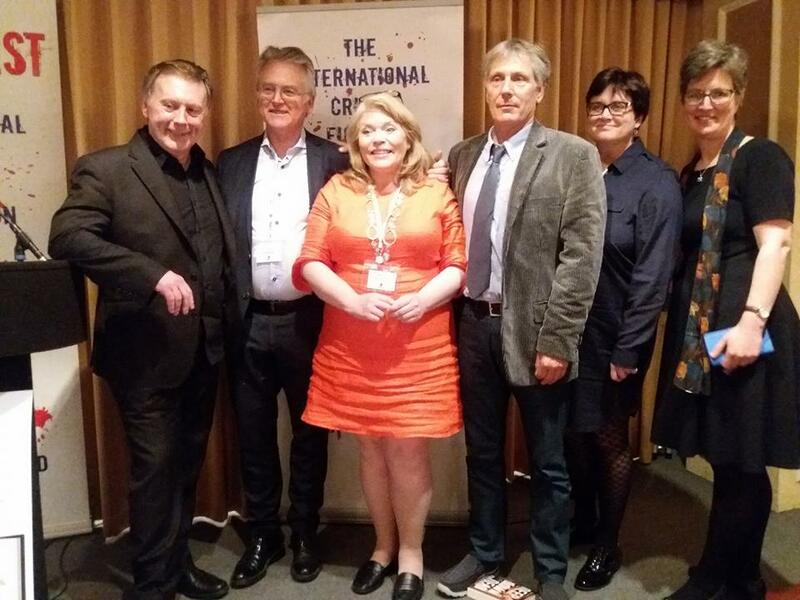 On 20 May 2017, at the Gala Dinner at CrimeFest, Bristol, Petrona Award judges Barry Forshaw and Sarah Ward announced the winner of the 2017 Petrona Award for the Best Scandinavian Crime Novel of the Year. The winner was WHERE ROSES NEVER DIE by Gunnar Staalesen, translated from the Norwegian by Don Bartlett and published by Orenda Books. The trophy was presented by last year's winner Jørn Lier Horst. 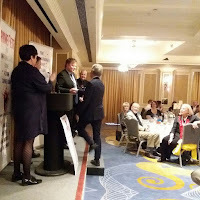 As well as the trophy, Gunnar Staalesen receives a pass to and a guaranteed panel at next year's CrimeFest. Gunnar Staalesen has long been the finest Nordic novelist in the private-eye tradition of the American masters. WHERE ROSES NEVER DIE is both a coruscating and ambitious novel from the veteran writer, and a radical re-working of his customary materials - perhaps the most accomplished entry in the long-running sequence of books about Bergen detective Varg Veum. The Petrona team would like to thank our sponsor, David Hicks, for his generous support of the 2017 Petrona Award. The Longlist for the CWA International Dagger 2017 was announced tonight at CrimeFest. The list includes two Petrona Award winners - Leif GW Persson and Jorn Lier Horst as well as several previous winners of the International Dagger: Andrea Camilleri, Pierre Lemaitre and Fred Vargas. Britain is at war. Returned from a dangerous mission onto enemy soil and having encountered an old enemy and the Fuhrer himself along the way, Maisie Dobbs is fully aware of the gravity of the current situation and how her world is on the cusp of great change. One of those changes can be seen in the floods of refugees that are arriving in Britain, desperate for sanctuary from the approaching storm of war. When Maisie stumbles on the deaths of refugees who may have been more than ordinary people, she is drawn into an investigation that requires all her insight and strength. Running her own private investigation agency, Maisie has plenty of work coming in and is busy with current enquiries when she is approached at her home address by a lady known as Dr Francesca Thomas who explains that she wants to employ Maisie and her firm to try to prevent a murder from happening. Dr Thomas works for the Belgian Government and explains that several thousand refugees fled their country during the Great War and many had settled in the UK, changing their names if appropriate. One Belgian named Frederick Addens, was unfortunately found dead in St Pancras Station in early August, shot in the back of the head. According to Dr Thomas, Scotland Yard were not too interested in spending a lot of time investigated the death of a foreign national, particularly at a time of heightened security because of the impending war. Dr Thomas said a Detective Inspector Caldwell at Scotland Yard was in charge of the case and Maisie has had dealings with him before. She wants Maisie to look into the case and she will pay all the expenses. Maisie reluctantly takes up the case and asks her assistants, Billy Beale and Sandra Pickering at her Fitzroy Square, London W1 office address to look into various aspects of it immediately. Using all the skills that she has picked up in over ten years of investigations Maisie soon sets to work in solving this latest case. Maisie also has to look into a couple of other cases which are similarly quite complex but this adds to the enjoyment of this very gripping story. 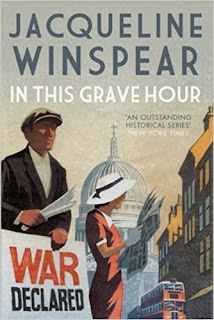 Jacqueline Winspear is a very gifted author of historical mystery thrillers and I am very pleased to have the opportunity to review her latest work. I have read for review several of her previous books and consequently I appreciate the very detailed research that the author makes when plotting her stories. You really get a good sense of what daily life was like in the 1930s. This is a very high quality story with very good characterisation of Maisie, Billy and the other lesser characters which are so insightful that they just leap off of the page. I enjoyed reading this story immensely and I do look forward to reading more of the highly intriguing adventures of Maisie from this very idiosyncratic and evocative writer. Extremely well recommended. The Dagger in the Library is a prize for a body of work by a crime writer that users of libraries particularly admire. 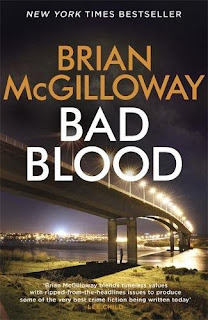 It is one of the most prestigious crime writing awards in the UK and previous winners include Elly Griffiths, Christopher Fowler, Sharon Bolton, Belinda Bauer, Alexander McCall Smith, Stephen Booth, Peter Robinson and Lindsey Davis. The CWA, in discussion with its 2017 partners, The Reading Agency, revised the 2017 Dagger in the Library format so that, uniquely among crime-writing awards, only library staff were able to nominate authors. Nominations were received from 175 libraries across the UK and Ireland. The CWA worked with The Reading Agency, local libraries and the Crime Readers’ Association to promote novels from the longlisted authors to reading groups nationwide and feedback received from reading groups via Reading Groups for Everyone was a major factor in the judges’ shortlisting. The winner will be announced at a short reception to immediately follow the Bodies from the Library event at the British Library on Saturday 17 June, promptly at 5.30pm. 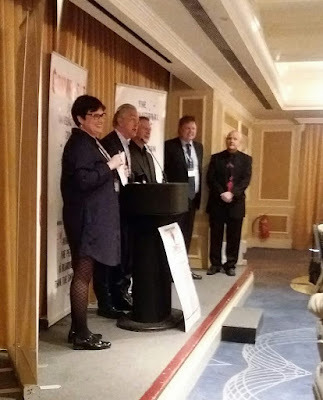 The Crime Writers’ Association has appointed its first Libraries Champion, Ruth Dudley Edwards. Ruth and the CWA will work with libraries nationwide to support the public library network, promote the value of reading for people of all ages and from all backgrounds, and promote crime writing. Martin Edwards, Chair of the CWA, said, “Ruth Dudley Edwards is the ideal person to lead this exciting initiative. The CWA already has strong links with libraries throughout the country. Our annual Dagger in the Library award has been highly prized for 20 years, and June sees National Crime Writing Month, with crime writers appearing at libraries throughout Britain, as well as our Alibis in the Archive conference at Gladstone’s Library, near Chester. It's back - Amazon.co.uk are repeating their offer of making the first episode available to "buy" for free, this time in 62 TV series - you can download as well as stream. The list includes Scandi favourites such as Beck, Borgen, The Bridge, The Legacy, Occupied and additionally 1864, Modus, The Protectors, The Team and Follow the Money. Also included are: French series Braquo ; Israeli series Hostages; Polish series The Border; Belgian series The Outlaws and the Australian series The Code. British series include Happy Valley, Hinterland, Luther, The Missing (II) and Shetland. Browse the whole list on Amazon. Nora focused on the pictures on the wall behind him. They were copies, blown up to triple size. That in itself wasn’t frightening. What made the hairs on Nora’s arms stand up was that pretty much under every picture, there was a name. And underneath the name, the laconic message: Missing. A coastal town, southern England. A middle-aged African school teacher calmly drinks tea as he recounts massacre, rapes and mutilations to Danish foreign correspondent Nora Sand. He explains his part in these horrific acts as: “clearing cockroaches out of the kitchen”. Nora hides her disgust and leaves Pete to take carefully anonymous photographs of the informant. They take the coastal road back to London, stopping at a tiny fishing village for a walk on the beach to drain the poisons of the Rwanda story. In the village Nora spots a leather suitcase in a junk shop window; definitely one for her collection. The shop is open and the deal is done. When she reaches her tiny London flat, Nora dumps the case and drops into bed, exhausted. The Crayfish, Nora’s boss at the Danish weekly Globalt, has never got to grips with time differences. So when he rings at 6.30 next morning, Nora staggers out of bed and trips over the suitcase in the middle of the floor. It falls open, spilling out a group of Polaroid photos which she hunkers down to examine: teenage girls, all in similar poses, looking straight at the camera, 1980s to 1990s by the fashions. One photo in particular catches her eye: this time two girls stand in front of a wall below a sign in Danish – Car Deck 2. Nora is working on the Rwanda story when she is interrupted by the entryphone. Her old friend Andreas, now with the Danish police, now in London on a course, is now on her doorstep for their forgotten lunch date. He studies the Polaroid of the two girls, and spots a bracelet of lettered beads. An L? E or I? Over lunch they agree that something bothers both of them about the photo and Nora remembers a TV documentary about two Danish girls who went missing from a passenger ferry in the 1980s. They had been heading to England for a short trip as part of a group of teenagers from a care home. They vanished during the crossing, a backpack on the sun deck the only trace. Neither were seen again and the adults in charge of the group went on trial for negligence. Danish news correspondent Lone Theils was based in London for 16 years. Now back in Denmark, she has written a debut crime novel that achieves just what she set out to do – combine her love of British crime stories with Nordic Noir. It introduces Danish journalist Nora Sand; her complex family relationships; her passion for investigative journalism and kick-boxing (shared with the author) and her hectic life which in this novel criss-crosses the North Sea between England and Denmark tracking her obsession with the idea that her second-hand suitcase and the photos it contained belonged to a notorious serial killer. En route she encounters police investigators in both countries who are still haunted by disappearances as well as the whereabouts of Hickley’s victims’ bodies. The case leads Nora to Scotland Yard and a list of missing girls from across Europe compiled by profiler Jeff Spencer’s team and then through the gates of a notorious prison and into the presence of the rarely interviewed killer William Hickley. Translated from the Danish by Charlotte Barslund (translator of Gazan’s THE DINOSAUR FEATHER, Enger’s BURNED and more), FATAL CROSSING's pace quickly takes hold as the plot gains complexity (alongside Nora’s private life) and explores both the troubled past of the children from the care home in Denmark and the sedate and seemingly soft life of English seaside towns. (I did wonder if this complexity allowed a red herring to swim past me – but perhaps that was due to my lack of sleep as I read on through the night). 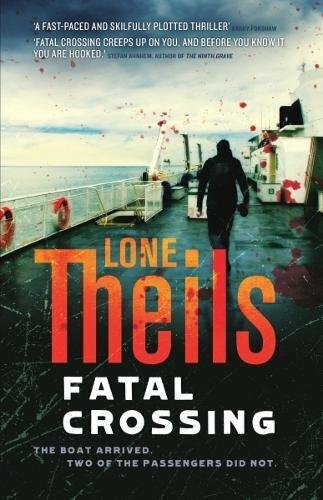 Although lacking some of the objectivity that I like in my favourite Nordic Noirs, this is an accomplished and exciting crime novel. 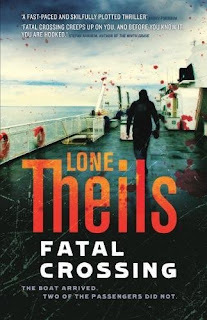 With a second Nora Strand book published in Denmark I hope there will be more from Lone Theils to satisfy those readers who like to travel with their crime-reading as well as those readers who like to stay at home – be they Danish or British. 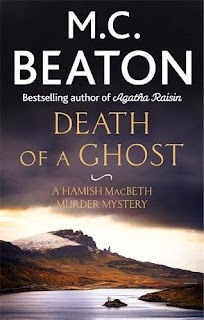 I'm a huge fan of M C Beaton's Hamish MacBeth series set in the Highlands of Scotland, which has been running for over thirty years now. Though time stands still in terms of the characters' ages they do move with the times in terms of modern accoutrements such as iPhones. 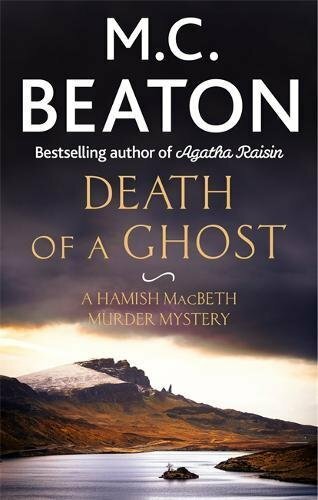 In this latest outing, DEATH OF A GHOST, Hamish and his latest police sidekick/colleague Charlie are summoned by an ex-police superintendent who has bought a castle in the dismal and remote loch-side village of Drim. The former police bigwig, nicknamed Handy, has been hearing howling, “haunted”, noises from the disused tower attached to his historic home. Hamish and Charlie agree to spend a night in the tower to dispel the myth of a ghost. What they find however is not an airy-fairy ghost but an honest to goodness dead body. And so begins an investigation into the residents of Drim and uncovering their secrets and desires and along the way there are more murders. As well as the murder enquiries, we catch up briefly with all of Hamish's previous colleagues who have spent a short while with him in his police station/home in Lochdubh and his former love-interests Priscilla and Elspeth make brief and slightly longer appearances respectively. I dive into this series whenever I need a bit of light relief and a trip to beautiful countryside. This one caught me particularly off guard with the identity of the murderer. M C Beaton manages to keep this series fresh, despite it having over thirty entries and I always look forward to the next one. If you like one, you'll like them all. British cozy crime is having a bit of a resurgence at the moment and if you like that sub-genre then why not start with the very first Hamish, DEATH OF A GOSSIP. Here's a snapshot of what I think is published for the first time in May 2017 (and is usually a UK date but occasionally will be a US or Australian date). May and future months (and years) can be found on the Future Releases page. If I've missed anything do please leave a comment.